Chtourou et al. (2012) investigated the impact of warm-up music on wingate (30-second maximal effort bike sprint) performance in nine young male sprinters . When the young sprinters played warm-up music, they performed better on the wingate test by obtaining higher mean and peak power values. It was not clear whether or not the music used by the sprinters was self-selected. In the following sections, you will understand why that is an important factor . In essence, warm-up music positively impacted performance during a 30-second, maximal intensity bout. For her graduate thesis, Zappitelli (2015) performed an experiment quite similar to that of Chtourou et al. (2012), but in Zappitelli’s study, the cohort was Division I track and field athletes, and the warm-up music was self-selected . The athletes had better 30s wingate test performances with warm-up music, compared with no warm-up music; they exhibited higher mean and peak power, as well as higher mean and peak work values . Once again, warm-up music (self-selected) was associated with improved performance during a subsequent 30-second, maximal intensity bout. In 24 elite, adolescent, national-team level volleyball players (12 males; 12 females), Eliakim et al. (2007) also assessed the impact of warm-up music on subsequent 30s wingate test performance . The music played consisted of three songs which were popular at the time, but was not self-selected. Rating of perceived exertion (RPE) and mean heart rate values (beats/minute) were higher post-warm-up when music was played, but there was not a significant effect on subsequent wingate test performance . There were very slight improvements associated with warm-up music, but the improvements were not statistically significant. Warm-up music was associated with increased exertion during the warm-up, but did not affect subsequent anaerobic performance. The effects of warm-up music on subsequent anaerobic or maximal effort performance is mixed. When the music is self-selected, there appears to be a higher likelihood of performance improvements. Hutchinson & Sherman (2014) put 42 endurance-trained recreational and collegiate athletes through a multistage Bruce protocol (VO2max protocol) with pre-selected music playing in the background . Participants were allowed to control the music volume throughout the test, using small remote controls in their hands. There was a sharp rise in preferred music volume just before ventilatory threshold (i.e. anaerobic threshold), which is also where ratings of “music usefulness” peaked . In other words, when the intensity got high, the participants chose to increase the music volume. In 2004, Atkinson and colleagues found that fast-paced music resulted in a 2% improvement 10-km cycling time trial performance and higher rating of perceived exertion (RPE), compared with no music, in 16 physically active participants . Most of the improvement came within the first 3-km of the trial. SIDE NOTE: As you will soon see, this data jibes well with the data recently collected by Ballmann et al. (2018), where an association between self-selected music and increased performance during the first three repetitions of bench press to failure were observed . Now, back to the study by Atkinson et al. (2004). The music was pre-selected and fast-paced. The authors noted that the music selection was commonly played in night-clubs in the UK…music which, of course, all participants were familiar with. The participants rated the “tempo” and “rhythm” of the music as more motivating than the “harmony” and “melody” aspects . The pace of music matters for motivational purposes. Lim et al. (2009) investigated the impact of music timing on a 10-km cycling time trial performance in 11 physically active men, ranging from recreationally trained, to elite cyclists . The fast-paced music being played was chosen by a researcher, and there were three study conditions: (1) no music at all during the trial, (2) music played during the 1st half of the trial; or 0-5km, and (3) music played during the 2nd half of the trial; or 5-10 km. There were no were no differences in time trial performances between the three conditions . This data is contrary to the aforementioned report by Atkinson et al. (2004). High music volume, or an increase in volume, during exercise periods where maximal, or near-maximal exertion is imminent, may benefit performance outcomes. When music is not self-selected, faster-paced music exposure is more likely to result in favorable performance outcomes, compared with slower-paced music options. Back in 1996, Karageorghis and colleagues performed an experiment looking at the effects of music tempo on hand grip strength in 50 collegiate exercise science students (25 men; 25 women), . The music was not self-selected; “Let me be your fantasy” by Baby D was the fast-paced song, and “We have all the time in the world” by Louis Armstrong was the slow-paced song. Both songs had been on the Top 10 of the British Music Chart during the six months prior. Relative to listening to white noise, the stimulatory (fast-paced) and sedative (slow-paced) conditions resulted in higher and lower force production on the hand grip task, respectively . This is evidence that the pace of music may affect performance during resistance exercise tasks. Crust (2004) investigated the effects of music on an isometric holding task in 27 male collegiate exercise science students . The task was to hold a 2.2kg weight in front of the body for as long as possible, while seated (i.e. think of a single-arm front shoulder raise). Having self-selected music exposure throughout the isometric hold (even when music exposure was just for the first half of the task) was associated with substantial performance improvements, whereas there were no effects on performance when the music was played before the task commenced . In other words, “warm-up” music was ineffective, but music played during the task itself had a positive effect on performance. A study by Biagini et al. (2012) deviates from the majority of research findings in the area . In their study of 20 resistance-trained men, there were no differences in strength-endurance bench press performance (three sets of repetitions to failure with 75% 1-RM; two minutes rest in between sets) between participants who listened to self-selected music and those who did not listen to music during the testing. Interestingly, the authors also investigated power performance by having the participants perform three squat jumps with 30% 1-RM, with one minute rest in between sets. Self-selected music had a positive effect in this regard: takeoff velocity and rate of force development during the squat jumps were higher in the group that had music exposure . The methods of this study differ from most others, but the results suggest that speed-strength was enhanced with coinciding self-selected music, but strength-endurance performance was not. Bartolomei et al. (2015) tested 1-RM bench press and repetitions to failure using 60% 1-RM, in 31 resistance-trained male sports science students . There were no differences in maximal strength performance (bench press 1-RM), but strength-endurance performance (bench press repetitions to failure with 60% 1-RM) was 5.8% higher (about one repetition more) when the participants listened to self-selected music, compared with the no-music condition . Self-selected music was associated with improved strength-endurance performance, but not maximal strength performance. In a similar experiment, Kose (2018) tested 1-RM bench press and repetitions to failure using 60% 1-RM in 26 healthy male college students . While there was no effect of self-selected music on maximal strength (1-RM bench press), a 3.9% increase in strength endurance (bench press repetitions to failure with 60% 1-RM) was observed when compared with the no-music condition . Again, self-selected music was associated with improved strength-endurance performance, but not maximal strength performance. This brings us to a study by Ballmann et al. (2018), which was recently published in the Journal of Strength and Conditioning Research . Similar to much of the aforementioned research in this section, Ballmann and colleagues investigated the impact of music exposure on strength-endurance bench press performance. 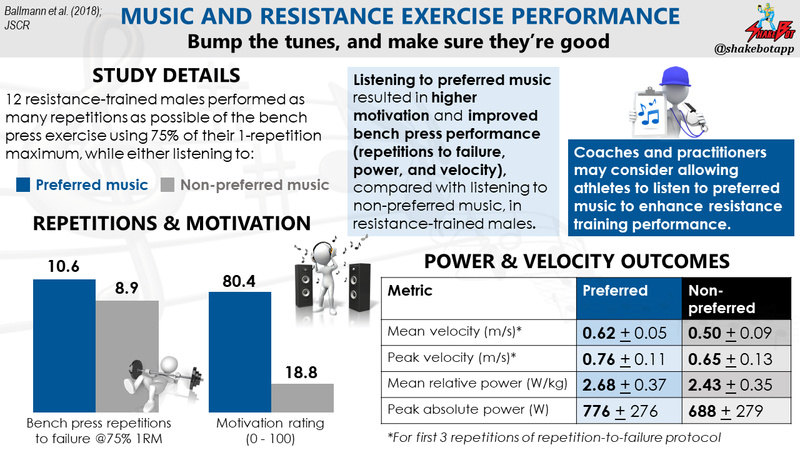 Twelve resistance-trained males performed as many bench press repetitions as possible using 75% 1-RM while listening to either (1) preferred music, or (2) non-preferred music. Listening to preferred music was associated with a higher level of motivation and greater number of repetitions before failure. Additionally, listening to preferred music was associated with velocities and power outputs. Similar to the performance improvements observed during the beginning of a 10-km cycling time trial with music exposure, bench press mean and peak velocities were escalated during the first three repetitions (i.e. beginning of the bout) when preferred music was played. Preferred music during training was associated with higher motivation, and more favorable strength-endurance outcomes, compared with nonpreferred music. Ballmann et al. (2018). Effects of preferred vs. nonpreferred music on resistance exercise performance. Music exposure does not appear to impact maximal strength, but it can positively influence resistance training tasks including maximal repetitions at a submaximal intensity, speed-strength or power, and isometric task performance. Self-selected music is preferred and, when music cannot be self-selected, faster-paced songs are likely to elicit more favorable training outcomes, compared with slower-paced options. See the work of Bigliassi et al. (2013) for a more comprehensive review of the research, at that time . The authors discuss the potential mechanisms and ergogenicity for music on physical exercise . Self-selected music takes the cake for high-intensity exercise performance enhancement. Individuals performing exercise at sustained high or maximal intensity will likely benefit from selecting their preferred music for the occasion. Music exposure doesn’t appear to impact maximal strength performance (i.e. 1-RM). Strength-endurance activities are better suited for music-induced benefits. When in doubt, go fast(er). Although this is not always the case, faster-paced music options are more likely to positively impact performance, compared with slower-paced, more sedative options. Going hard? Pump up the volume. When things get tough (i.e. training close to ventilatory or anaerobic threshold), individuals choose to raise the volume of music, which they believe to be helpful. There’s a lot we don’t know. Much of the research reviewed here was performed on recreationally active, young individuals. Investigations in other cohorts, particularly trained indviduals and elite athletes, is warranted. As a coach, or gym owner, it’s your duty to ensure that DJ duties of the facility or exercise area(s) are covered. 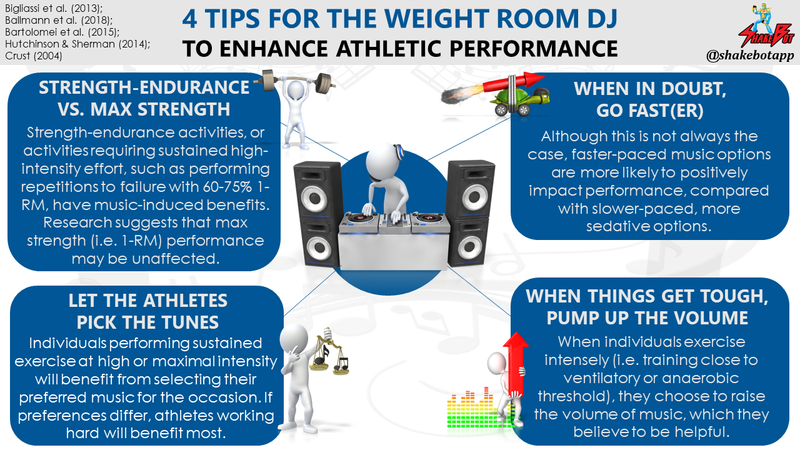 Particularly in high-level sport, where a 1% performance enhancement can make all of the difference, it would be wise to manipulate music exposure in your training environment, to the advantage of your athletes. One of my favorite scenes of all time. Enjoy this clip from Step Brothers. Chtourou, H., Jarraya, M., Aloui, A., Hammouda, O. and Souissi, N., 2012. The effects of music during warm-up on anaerobic performances of young sprinters. Science & Sports, 27(6), pp.e85-e88. Zappitelli, M., 2015. The effect of warm up music compared to no warm up music in collegiate anaerobic athletes. Eliakim, M., Meckel, Y., Nemet, D. and Eliakim, A., 2007. The effect of music during warm-up on consecutive anaerobic performance in elite adolescent volleyball players. International Journal of Sports Medicine, 28(04), pp.321-325. Hutchinson, J.C. and Sherman, T., 2014. The relationship between exercise intensity and preferred music intensity. Sport, Exercise, and Performance Psychology, 3(3), p.191. Atkinson, G., Wilson, D. and Eubank, M., 2004. Effects of music on work-rate distribution during a cycling time trial. International Journal of Sports Medicine, 25(08), pp.611-615. Ballmann, C. G., Mccullum, M. J., Rogers, R. R., Marshall, M. M., & Williams, T. D., 2018. Effects of preferred vs. nonpreferred music on resistance exercise performance. Journal of Strength and Conditioning Research, 1. Lim, H.B.T., Atkinson, G., Karageorghis, C.I. and Eubank, M.M., 2009. Effects of differentiated music on cycling time trial. International Journal of Sports Medicine, 30(06), pp.435-442. Karageorghis, C.I., Drew, K.M. and Terry, P.C., 1996. Effects of pretest stimulative and sedative music on grip strength. Perceptual and <otor Skills, 83(3_suppl), pp.1347-1352. Crust, L., 2004. Carry-over effects of music in an isometric muscular endurance task. Perceptual and Motor Skills, 98(3), pp.985-991. Biagini, M.S., Brown, L.E., Coburn, J.W., Judelson, D.A., Statler, T.A., Bottaro, M., Tran, T.T. and Longo, N.A., 2012. Effects of self-selected music on strength, explosiveness, and mood. The Journal of Strength & Conditioning Research, 26(7), pp.1934-1938. Bartolomei, S., Michele, R.D. and Merni, F., 2015. Effects of self-selected music on maximal bench press strength and strength endurance. Perceptual and Motor Skills, 120(3), pp.714-721. Köse, B., 2018. Does motivational music influence maximal bench press strength and strength endurance?. Asian Journal of Education and Training, 4(3), pp.197-200. Bigliassi, M., Estanislau, C., Carneiro, J.G., Kanthack, T.F.D. and Altimari, L.R., 2013. Music: A psychophysiological aid to physical exercise and sport. Archivos de Medicina Del Deporte, 30, pp.311-320.